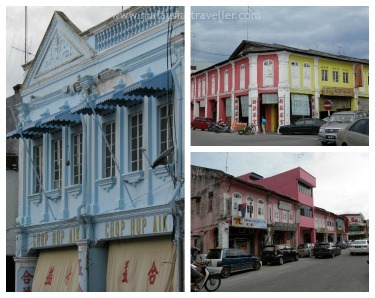 Muar Walking Tour - Tips on what to see and where to eat. Welcome to Malaysia Traveller's self-guided Muar Walking Tour, the best way to experience the highlights of Muar, Johor's royal town. Muar does not take up much space in travel guide books. Tripadvisor.com's page on 'Things to do in Muar' for example is blank. But just because a place does not have major tourist attractions, it does not mean there is nothing worth seeing. Take some time to walk around and you will see that Muar is a pleasant town with many things to see as I found out on my recent visit. I started my Muar walking tour at Tanjung Emas, a park on the western end of Jalan Peteri, alongside the mighty River Muar where it reaches the sea. There is plenty of free parking here and a relaxing walkway has been constructed along the bank of the river. This walkway passes Dataran Tanjung Emas, an open padang area with a kind of fancy grandstand at one end which is probably used at ceremonial occasions, Merdeka celebrations and so on. Next on our Muar walking tour is the imposing Masjid Jamek Sultan Ibrahim, a sky-blue coloured mosque built in 1927. There is an identical mosque built on the opposite bank of the river. This twin is much newer, having been built in 1999. Continuing along Jalan Peteri we pass in front of a Royal rest palace, a building which looks like it was built in the 1960s in what was no doubt at the time, a state-of-the-art and futuristic design. Today it looks rather dated, like something out of an old James Bond film, but a design classic all the same. 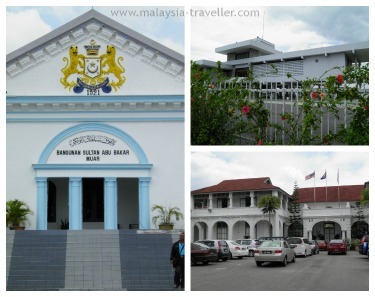 As mentioned, Muar is the royal capital of Johor state and is known as Bandar Maharani or Town of the Empress. Across the street is an old High School, a heritage building with the date 1915 inscribed over the entrance. Nearby stands Bangunan Sultan Abu Bakar painted in a blue and white with the Johor state emblem and the date 1921 above the entrance. It contains local government offices. Opposite is the former courthouse, built in the 1920s in classic colonial style. It is currently vacant. 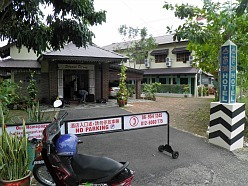 Next door is the Muar police station, another heritage building still in use by the police. Turning into Jalan Othman, there is another white colonial era building in a compound used by the telephone company so perhaps it used to be a post office. Also on this street is a row of terraced houses known as the Old Dutch Houses. They are dated 1928, well after the Dutch era so I don't know why they are called Dutch - perhaps the architectural style or maybe a reference to some former residents. 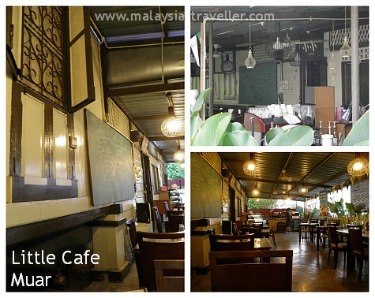 Around the corner, on Jalan Ibrahim stands the Little Café, a cosy eatery in an old wooden house serving a range of western and Malaysian dishes (with free Wi-Fi). Left: Sri Murugam Temple. Top: Old 'Dutch ' Houses. Bottom: Customs Building. 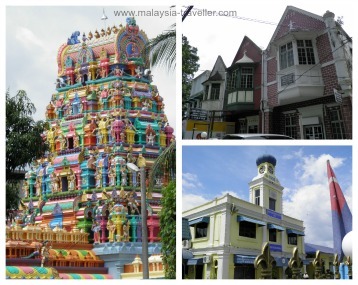 The Muar Walking Tour route then takes us through a busier commercial area where you can admire the Sri Murugan Temple on Jalan Meriam with its ornate and colourful gopuram (tower). 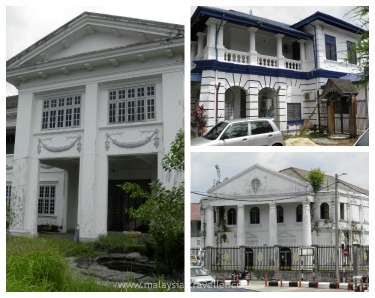 Reaching Jalan Maharani you will pass the Royal Customs and Excise Building, another heritage building dated 1909 but whose facade has been spoilt by the installation of modern windows. 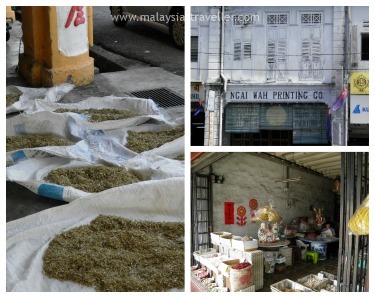 There are a number of interesting old shophouses on this street selling a wide range of produce including dried seafood. Left: Muar Clock Tower. 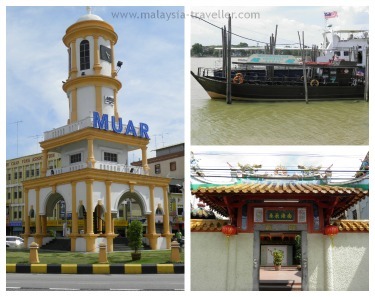 Top: Muar River cruise boat. Bottom: Nan Hai Fei Lai temple. The jetty for the Muar River Cruise boat is located here (another cruise pick-up point is back at Tanjung Emas where the walk started). Unfortunately it was all locked up and nobody around to ask during my visit otherwise I might have taken the boat trip. The Sultan Ismail Bridge spans the river at this point and here you can see the yellow painted Muar clock tower, one of the town's most famous landmarks. The stairs into the interior of the tower were padlocked. Close by, opposite the Bentayan Bus Terminal is a small Chinese temple, Nan Fei Lai Goddess of Mercy, said to be the oldest in Muar. Near here is Café 434. You can't miss it with its bright yellow exterior and advert for Elephant Bean coffee which is a speciality of the house. Inside, the café has a Swiss chalet feel to it. Very unusual and unexpected in a place like Muar. 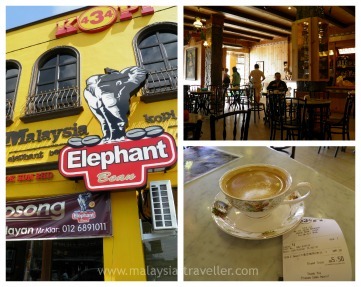 I tried the Elephant Bean coffee which was not bad at all with a strong, rich taste. Suitably refreshed I explored this old part of town where each street of shophouses is painted a different colour, so there are pink streets, yellow streets, blue, green and so on. The effect of this colour coding is to give the streets a neater, more uniform appearance and helps to mask the mish-mash of architectural styles. I was not really hungry at this stage but for my final stop I had to see the area around Jalan Ali/Jalan Haji Abu known as Hunger Street. 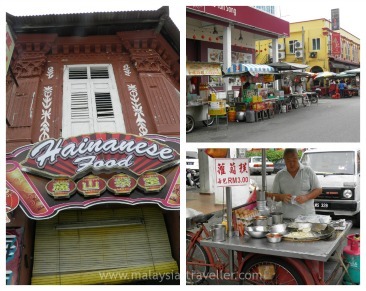 Here there is a wide variety of restaurants and food stalls serving all kinds of Malaysian food, especially Chinese food, including all the dishes for which Muar is famous. From here you could either take a taxi (if you can find one), bus or trishaw back to where you parked your car or you could walk back like I did. 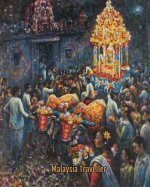 If you follow the route marked on the map, the total distance covered by the Muar Walking Tour is about 7km. You can find more photos of Muar on my blog. I stayed slightly out if town at a place called the Sabak Awor Resort as they were offering a very reasonable rate. It's a budget hotel with 40 rooms. It had all the essentials: attached bathroom, hot water, TV, shower, air-conditioning and Wi-Fi (though not working well in my room), breakfast. 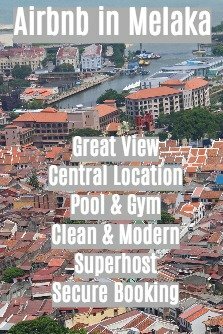 It faces onto the Muar River but the location is a little too untidy to be called a 'resort'. Still, I thought it was good value for money. To check on rates and availability of the Sabak Awor Resort or other hotels in Muar you can take a look at Agoda's website.